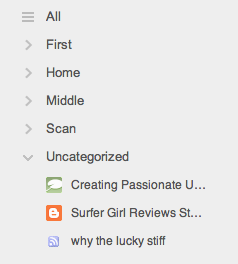 Like many other people, I switched to Feedly as my Google Reader replacement. The import worked well; as part of that process, in the “Uncategorized” category, I found dozens of blogs that hadn’t published for years. And I’m not sure that making access to the archives of those (in some cases deleted) blogs harder is entirely consistent with a vision of “Organizing the World’s Information”. Creating Passionate Users probably actually had the most impact on me personally. (Though if I’d come to why earlier, that might have been different.) It, along with a few other blogs (Presentation Zen, at least) was saying things about how to talk to people and how to relate to people that I hadn’t seen articulated that way before.